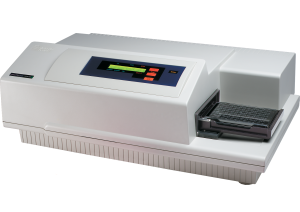 The Gemini EM Microplate Reader with dual monochromators lets determination of optimal excitation and emission settings for the fluorescence intensity assays. The system helps in creation of custom fluorescence assays without having to purchase expensive filter sets and also easy switch over between the top and bottom reading modes for solution- and cell-based assays. Comprehensive validation package for the system include : SpectraTest® ABS1, FL1 and LM1 Validation Plates for hardware validation of absorbance, SoftMax Pro Software validation package, Software tools for FDA 21 CFR Part 11 compliance.